Over the last few years Peirene Press have provided us with one of the most stimulating and invigorating libraries of European fiction. For this year’s coming of age series they have already drifted beyond the Eastern edges of Europe with Hamid Ismailov’s The Dead Lake; now, as the final title, Under the Tripoli Sky, suggests, they have crossed the Mediterranean Sea to North Africa. 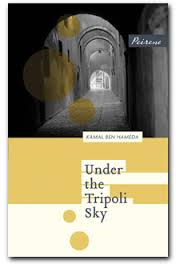 Its author, Kamal Ben Hamida, is a native of Libya, though, like so many writers, has spent much of his life outside his homeland. Known mainly as a poet and musician, Under the Tripoli Sky is (as far as I know) his only novel. What Hameda does brilliantly is balance the joy that many of the women still find in their life, with the difficulties they also face. Yes, it is a coming of age story, as Hadachinou is educated by the many women he observes and talks too, not only relatives and neighbours, but prostitutes and, at one point, a bearded lady from a visiting freak show. But it is also a wonderful picture of society, of the various social classes and the different races, religions and nationalities. Neighbours and friends include an Italian and a Jew, and then there is the black servant he regards as a ‘sister’. Of course, it might be objected that this is a society without men (Women without Men would have been an appropriate alternative title), but that would be to ignore novel after novel which purports to represent society but where women are absent. That aspect, among many others, make this a timely portrait of a country that we may have never seen this way before. You are currently browsing the archives for the Kamal Ben Hameda category.